Next Monday in London there is a talk and discussion about police corruption and racism, with particular focus on the work of undercover officers to disrupt and undermine campaigns for justice, and looking ahead to the public inquiry and beyond. As a result of the Ellison Review into the allegations of police corruption and spying of the Stephen Lawrence family and campaign, the Home Secretary has been forced to announce a Judge-led public inquiry into under cover policing. This is likely to take place next year in 2015. What is the significance of the Ellison review and what can done to ensure that the Inquiry is totally open and transparent to the public? Two lawyers involved in the undercover policing scandal were honoured at the Legal Aid Lawyer of the Year awards last week. Mike Schwarz of Bindman’s won criminal defence lawyer of the year. He represented two groups of climate protesters, the Drax 29 and Ratcliffe 20, who were convicted and then had the judgements quashed after it was revealed that the prosecution had withheld vital evidence of undercover police officer Mark Kennedy from the court. Elkan Abrahamson of Jackson Canter won the outstanding achievement award for his representation of many families of Hillsborough victims. Several of them were active campaigners who report having their phones tapped. Abrahamson’s firm also have a documented case of a Hillsborough campaigner being ‘shadowed like terrorists,’ as Steve Rotherham MP put it. Speaking after the Home Secretary announced the judge-led public inquiry into undercover policing in March, Abrahamson said, ‘It will, of course, focus on Lawrence, but the Hillsborough tragedy should equally be subjected to the same scrutiny on this subject of spying’. Somewhat ironically, the judging panel included Kier Starmer QC who has had involvement on both sides of the undercover police issue. He worked pro bono for the McLibel defendants who, despite occupying courtrooms for the longest trial in English history, were kept ignorant of the fact that at least two of their group were undercover police officers. 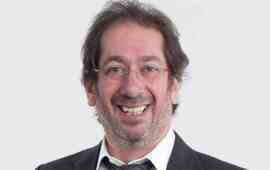 One of them, Bob Lambert, co-authored the offending leaflet that triggered the trial. Starmer was also the barrister who represented a group of hunt saboteurs in 1996 who had an eager witness called Jim Sutton, now known to be undercover officer (and Lambert’s protegé) Jim Boyling. But by the time Sir Christopher Rose’s report into Mark Kennedy and his unit was published in December 2011, Starmer was the Director of Public Prosecutions. The report said the Ratcliffe 20’s case was a one-off based on innocent errors and there was no systemic problem. Even then it was a highly dubious proposition, yet when Starmer was challenged on the point by Channel 4 News and Newsnight he fended off suggestions of a wider problem, asserting that Rose’s finding was good enough. However, the Drax case had already happened a year earlier in near-identical circumstances. The subsequent overturning of the Drax judgements indicates that there is indeed a systemic problem. Certainly, it leaves the Rose report discredited alongside the pile of piecemeal partisan investigations so far, underlining the need for a single, credible independent public inquiry into all aspects of Britain’s political secret police. With the help of tenacious lawyers like Schwarz and Abrahamson unpicking the cover-ups, the truth may come. Baroness Doreen Lawrence and human rights lawyer Imran Khan, who has acted for the Lawrence family for many years, are giving a lecture on Thursday evening in London. 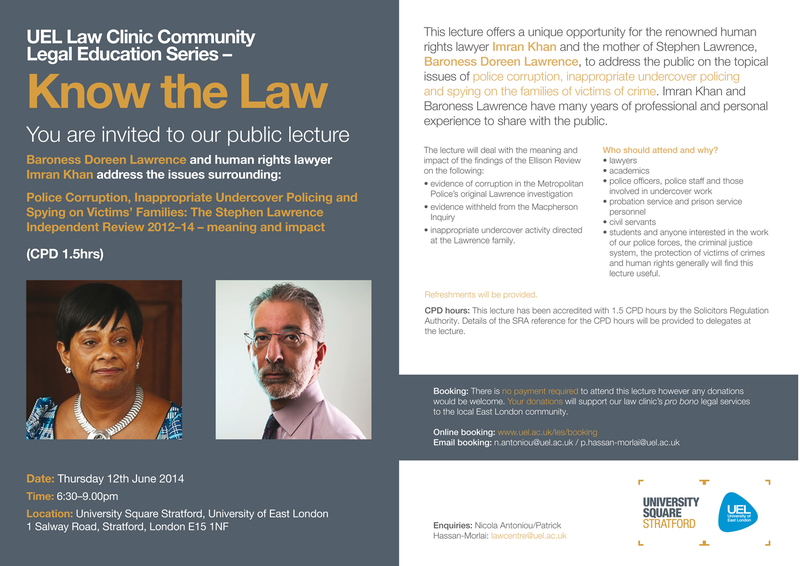 This lecture offers a unique opportunity for the renowned human rights lawyer Imran Khan and the mother of Stephen Lawrence, Baroness Doreen Lawrence, to address the public on the topical issues of police corruption, inappropriate undercover policing and spying on the families of victims of crime. Imran Khan and Baroness Lawrence have many years of professional and personal experience to share with the public. • inappropriate undercover activity directed at the Lawrence family. Booking: There is no payment required to attend this lecture however any donations would be welcome. Your donations will support the law clinic’s pro bono legal services to the local East London community. This week the women duped into long term relationships with undercover police officers are back in court in London and have called for a solidarity demonstration outside. 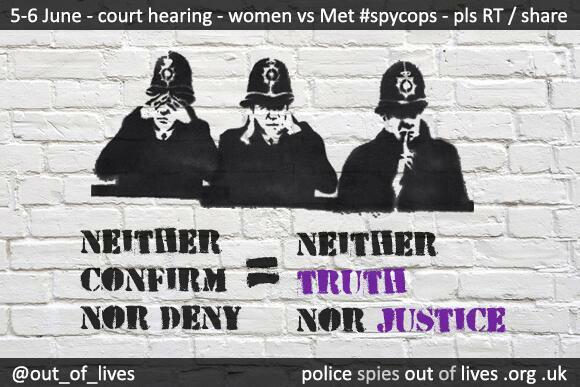 Eight of the women are supported by the Police Spies Out of Lives group. One of them, ‘Alison‘, lived with Mark Jenner for four years. She told her story to Newsnight earlier this year [on Youtube starting at 16.35]. Today she published an article on the Guardian site about the next stage of the court case. The police are obliged to provide disclosure and properly outline their case. They have failed to do so, citing a policy of ‘Neither Confirm Nor Deny’ (NCND); they say they cannot ever confirm whether somebody was an undercover police officer, and that this policy is essential to the integrity of important and dangerous undercover work. They went as far as applying to have the case struck out on the grounds that, as they would refuse to give proper testimony in court, they would be denying themselves a fair trial. The women launched their legal action in December 2011, but it was not until June 2012 that the police first mentioned NCND in relation to the claim. You might think if there had been such a long standing policy this would have been highlighted in the first police response. There have been innumerable exceptions to NCND, and the women gave the court two large files documenting some instances. After that, and the Ellison review‘s revelations earlier this year about spying on Stephen Lawrence’s family, the police abandoned their strike out the case. They’re still sticking to the ‘policy’ of NCND though. It is normal practice for the police to neither confirm nor deny the true identity of undercover officers. This is to protect both the officers themselves, and the effectiveness of the tactic. However, the case of Mark Kennedy is one of exceptional circumstances, including his own public revelations, the media interest in him, and the fact that the Court of Appeal named him on 19 July 2011. Because of this, HMIC has chosen on this occasion to use his real name. The information is out there and, like toothpaste out of the tube, you can’t put it back in. Mark Kennedy has not been magically deidentified. The current backslide shows that the stonewall use of NCND is both a recent invention and a tactic of obstruction. Of the other four officers named in the womens’ case, John Dines and Mark Jenner have been extensively documented, and Bob Lambert has not only been identified in the press and the Ellison Review but has given interviews candidly admitting to large parts of his work. The fifth, Jim Boyling, who was undercover as Jim Sutton, has also been comprehensively reported in the press, television and beyond. It would be hard to suspend him from police duty in January 2011 if he were not a police officer. Later in 2011 Metropolitan Police Commissioner Bernard Hogan-Howe confirmed that ‘Jim Sutton’ was an undercover officer [PDF, p22]. 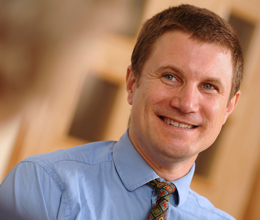 Because Boyling went through a 1997 court case under his false identity as Sutton, a convicted co-defendant has won the right to have the conviction overturned. But in a farcical twist at the hearing earlier this year – after this long-standing policy of NCND had been invented – the police backtracked and would not fully identify Boyling. They confirmed he was a police officer but not an undercover one. As if he might have done the undercover work as a hobby in his spare time. As if confirming that this man whose picture is all over the internet was a police officer doesn’t put him at just as much of a risk as admitting he was an undercover one. Police lawyers said they weren’t compelled to give any reason why they didn’t oppose the quashing. ‘What kind of justice is that?’ asked the judge. It’s a question we should all be asking. NCND is another manifestation of the ‘double injustice’ faced by so many victims of police abuse; there is what was done to them, and then there are the tricks of delay, distraction and denial to try to avoid accountability. Many of those who have been spied on – the family of Stephen Lawrence and numerous other black justice campaigns, anti-fascists, environmentalists, Hillsborough families and more – can tell a similar story. An police service interested in justice would do precisely the opposite. More, these blocks are such blatant decoy tactics, and they know it’s obvious to everyone. But as long as they aren’t forced into actually admitting that’s the case, they can conceal the truth of what they’ve done and deny justice to the citizens they abused. If this is their response to being caught committing the starkly cruel abuse of these women – the most complete invasion of privacy that it is possible for the state to enact – then what hope can we have for the promised public inquiry? The fight against NCND is not just a fight for the women concerned, but for everyone spied on by Britain’s political secret police, and for the hope of eventual truth and justice for the wider society. If you are in London, please join us outside the Royal Court of Justice, The Strand, from 9am–10am on Thursday 5th June to show your support for the women. You can follow the case’s progress on Thursday and Friday via the Police Spies Out of Lives Twitter. The Independent Police Complaints Commission announced today that three officers will be investigated over their roles in spying on the family of murdered teenager Stephen Lawrence. It follows revelations three months ago in the Ellison Review, confirming police had spied on the family at the time of the 1998 MacPherson Inquiry. Two of the three officers are now retired. They are Colin Black and Bob Lambert, and they face charges of discreditable conduct. Lambert is already under scrutiny in many other aspects of the secret policing scandal. As an undercover officer he co-wrote the McLibel leaflet that led to the longest trial in English history at which undercover police involvement was never revealed. He was named in Parliament as the firebomber of a Debenhams store, a charge he has strenuously denied. He fathered a child with one of the activists he targeted and abandoned them both when his deployment ended. He later ran undercover operations, overseeing the deployment of several other exposed controversial officers. The third officer is Commander Richard Walton. As well as discreditable conduct, he faces allegations of beaches of honesty and integrity. He was an acting Detective Inspector in 1998, but by this year he had risen to be head of the Metropolitan Police’s Counter Terrorism Command, the unit that has current responsibility for the secret police who would formerly have been employed by the Special Demonstration Squad (SDS) or National Public Order Intelligence Unit (NPOIU). Walton was moved from the post immediately after the Ellison report was published in March. Whilst any exposure of wrongdoing and accountability for those culpable is welcome, it cannot be a parcelling off that lets anyone claim the issue has been dealt with. Any findings must be part of the material for one overarching, credible, rigorous, open public inquiry into Britain’s Secret Police.